This year I'm posting original -- or at least older -- versions of songs recorded by Crumb & The Cheap Suit Serenaders. 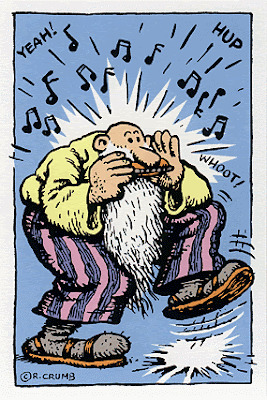 So happy birthday, Mr. Crumb! Crumb and the band based "Get a Load of This" -- one of their best-known tunes from the early '70s -- on Charley Jordan's "Keep it Clean." Crumb and the lads added some modern references -- "Bowling for Dollars," "pink burritos" etc. -- and, for reasons unclear to me, they changed Coca Cola to R.C. Cola. But you still hear a lot of the original in Crumb's version. Here's one Crumb got from this amazing old string band from Texas led by mandolinist Coley Jones. Crumb picked up this entendre-laden masterpiece from Harry Roy and His Orchestra.